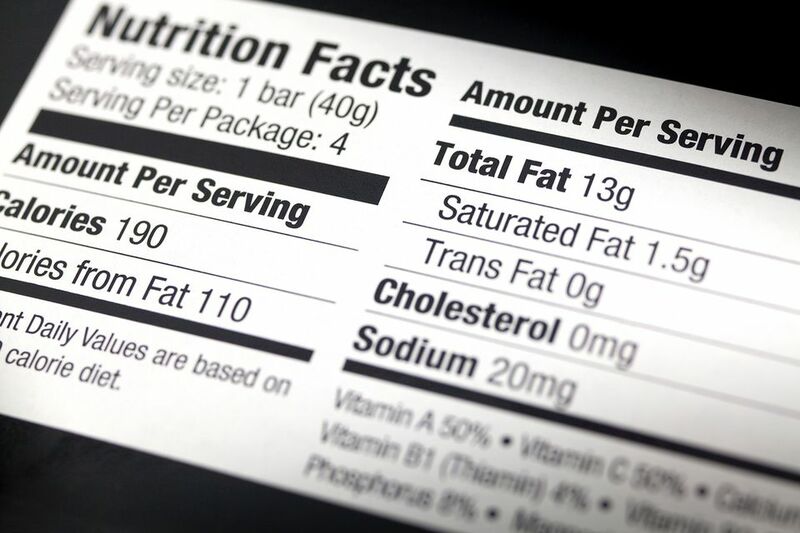 Dieticians recommend that as responsible consumers of food, you should be reading your labels. You need to know what you are eating. Do you know how many calories you consume when you eat the whole box, the whole can, the entire jar of anything? Also, when a product is labeled fat-free, does this mean there is literally no fat in it at all? In short, the answer is no. The U.S. Food and Drug Administration allows a company to label a food as "fat-free" if it contains less than 0.5 grams of fat per serving. For example, if you have a box of "fat-free" cookies, you might actually be consuming several grams of fat, depending on the number of cookies you eat. If a serving size is only one cookie, and that cookie is almost a half gram of fat, then if you eat six cookies, then you have consumed almost 3 grams of fat. If you eat a dozen, then that is nearly 6 grams of fat. The plain truth is that if you consume more than one serving of that food, it ceases to be fat-free. All those fractions of a gram do add up and count toward your daily fat intake. Something that most people seem to forget is that fat-free does not mean calorie-free, carbohydrate-free, or preservative-free. What some fat-free products lack in fat, they make up for in sugars and other unhealthy additives. So, although you may think you are doing yourself and your diet a favor by eating a fat-free food, your body may not feel the same way. For many years, the word from the medical community and large studies were there was a link between saturated fat and heart disease. Nutrition experts recommended low-fat diets, not only because of heart disease but because fats were higher in calories than protein and carbohydrates and were probably the cause of an increase in weight gain. As people cut the fat, they replaced the lost calories with a large number of carbohydrates, especially refined carbs, and stopped eating healthy fats like olive oil, nuts, and avocados. The result: the decline in fat consumption was accompanied by higher rates of overweight and obesity. However, the point that most people and nutrition experts seemed to miss was that not all fat is created equal. The fats that you needed to avoid were trans fats and some saturated fats. Your body needs some fat from food. Fat is a major source of energy. It helps you absorb some vitamins and minerals, and it is needed to build cell membranes, the vital exterior of each cell, and the sheaths surrounding nerves. It is essential for blood clotting, muscle movement, and combating inflammation. Nowadays, healthy eating means getting no more than 30 percent of your daily calories from fat. For an average diet, based on 1,800 calories per day, this would mean 540 calories or 60 grams of fat for the day. For someone with a higher calorie allowance in a day, for example, a person who should consume 3,000 calories in a day should eat no more than 100 grams of fat. For a good rule of thumb, 1 gram of fat is 9 calories. Fat-containing foods can also be part of a healthy-eating lifestyle. Your best bet is to choose lower-fat foods more often and eat a varied diet from the five basic food groups: Vegetables, fruits, grains, lean meats, and low-fat dairy.